Although skeptics remain, and there is still much to learn, Louisiana scientists have made great strides in learning how to put the Mississippi River back into its role as a land-builder. And although the Flood of 2011 was a missed opportunity, there have been some lessons learned. Sand is Land. A recent publication in Nature Geoscience updates us on the power of the river, and confirms the survey and modelling science that has re-defined the Myrtle Grove diversion project. A new, important lesson is that the concentration of sand flowing into the spillway in 2011 was higher than in the river channel itself. This is confirmation of the modelling done for Myrtle Grove diversion--the location of which has been re-designed along the river to capture sand in just this way. Capturing sand not only means more wetlands, but also less dredging for the Army Corps, and less heartburn about these river re-introductions from the shipping industry. “As the results came through, we began realizing just how efficient this particular structure is for building sediment,” he said. While the Bonnet Carré spillway skimmed off only the top 10 to 15 percent of the water column moving down the Mississippi, Dr. Nittrouer and his colleagues estimate that 31 to 46 percent of the sand in the river ended up in the spillway." This was a temporary riverbed. This amount of sand, deposited in a single year, is at least enough for a standard 500 acre marsh creation project. my own rendering of the extent of sand distribution across the spillway. light areas are sand dunes. there was at least enough sand deposited by the river during the 2011 event to build a standard 500-acre marsh creation project. What's the secret to sand? 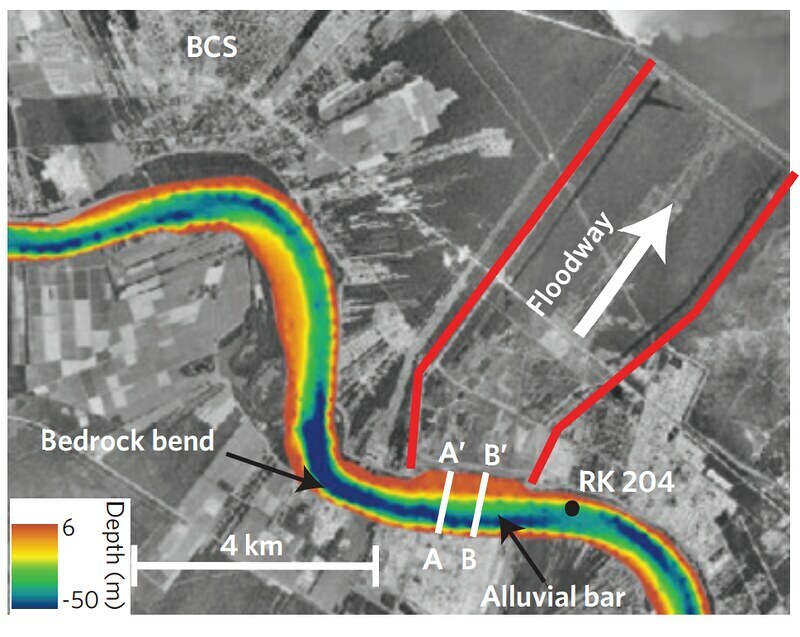 these researchers, as well as Dr. Ehab Meselhe of ULL and the Water Institute of the Gulf, have shown that placing the gates on the inside of bends just downstream of the peak of the curve maximizes the sand transfered by a sediment diversion. This lesson has already changed the way that the Myrtle Grove Sediment Diversion is being built. The areas in red in the above graph show where the river bottom approaches the surface--that is, where the river is shallowest. 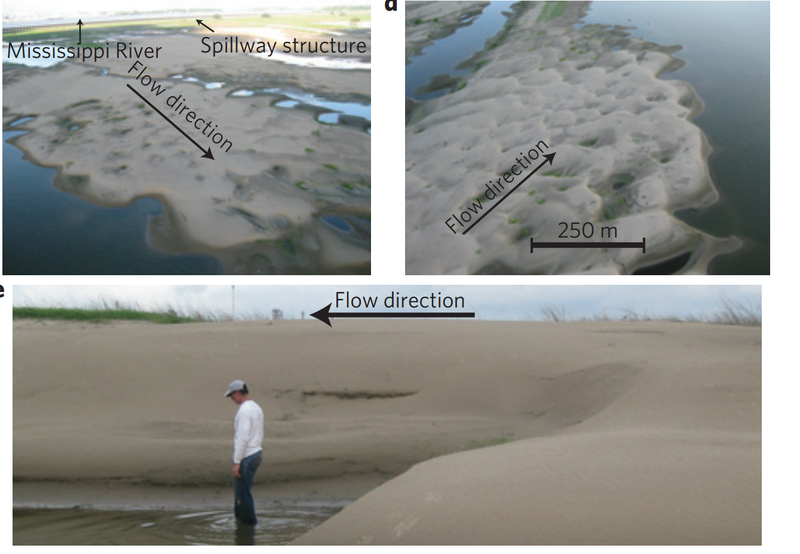 Where the river is shallowest, structures like diversions will capture the most sand per volume of water, during certain river stages. Perhaps it seems obvious in retrospect, but no diversion has yet been purposefully constructed this way. Historically, river re-introductions were built for the oyster industry; thus they were designed to minimize sediment, which covers the hard-bottoms that oystermen farm. It also had been thought that capturing the highest amount of water would ensure the highest amount of sediment, until Dr Allison and Dr Meserlhe showed differently. From Dr. Mead Allison. The blue arrow indicates the precise planned location for the Myrtle Grove Project, directly above the adjacent sand bed (red). The spillway, as a happy accident, or perhaps by its sheer length, is located in a good location to capture sand, and capture it in a way that saves the Army Corps dredging monies. The conflict over dredging monies has led to the de-authorization of two older sediment diversions already--West Bay and Benneys Bay. The design of Myrtle Grove has been altered to capture more sediment. 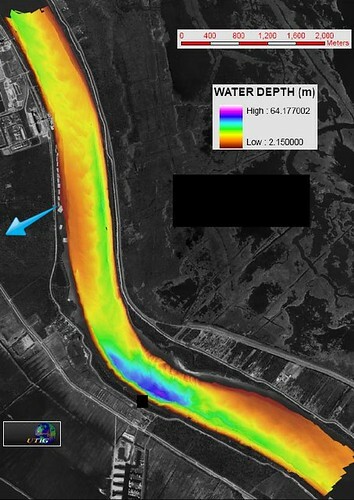 Below is a graphic than shows how the channel was moved half a mile (from the red to the blue footprint) to capture more sediment, based on computer simulations. This graphic also shows the proposed Coal pile and barge fleeting, directly upstream from the gates. One half a mile made all the difference, in the simulation, to the percent sediment captured. RAM Terminals, LLC and Armstrong Coal want the diversion channel moved for their coal pile (from blue to red), even though this will limit the sand caught by the diversion. 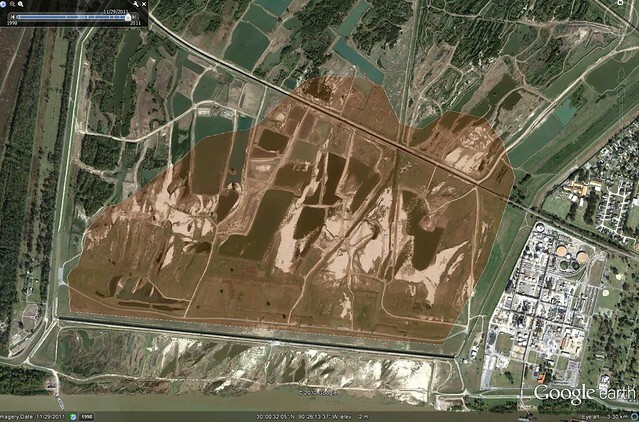 Additionally, dust from the coal pile will fall into the diversion channel, and coal fill will flow from spillage at the terminal on the River itself. 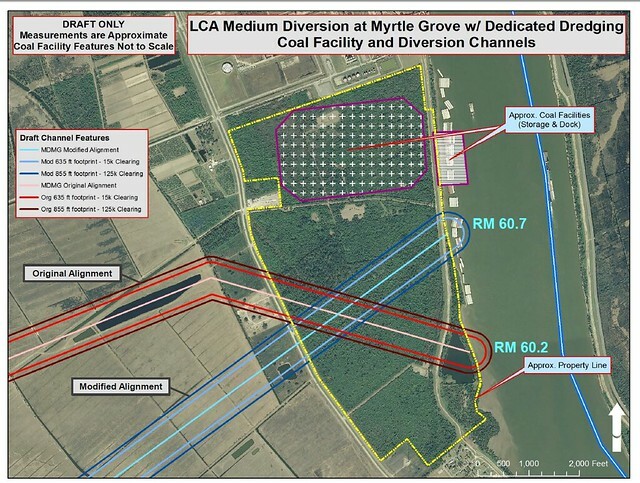 RAM terminals, LLC and Armstrong Coal want the USACE and LA-CPRA to move the diversion, so they can place a coal pile on top of Myrtle Grove and make money from Louisiana's climate of lax environmental enforcement. Yet, the gates have been designed with the river, using methods that took years and many, many dollars. Their request shows their callous disregard for Louisiana, the state's priorities, the effort and expertise of the men and women who designed the project, and our future. They have given no justification for siting their pile on top of this restoration project--there are already two other coal facilities in the area, which are expanding. We at GRN remain concerned about how the pollution in the Mississippi River sets these projects up for failure--the dirtier the river, the more likely that these methods of re-introduction will not help wetlands. The threat to the wetland project is just one of the reasons not to dump a pile of coal here; we do not want to put coal into the lungs of people in Ironton and Davant, and onto the citrus groves of Plaquemines. Nor do we want China or Chile to burn this coal and further damage our atmosphere. The damages and dangers of the coal project is simply not justified, for the limited economic gains coastal communities would get from being dumped upon. This latest confirmation from Nature that the State's strategy just might work is encouraging. All the more reason not to sabotage potential success. Tell the Army Corps, Louisiana DNR and Louisiana DEQ, that they cannot allow the premier coastal restoration project, the Myrtle Grove sediment diversion, to be polluted with coal runoff. At the very least, it is upon the coal company to come up with an alternate site, and fund an alternate plan.